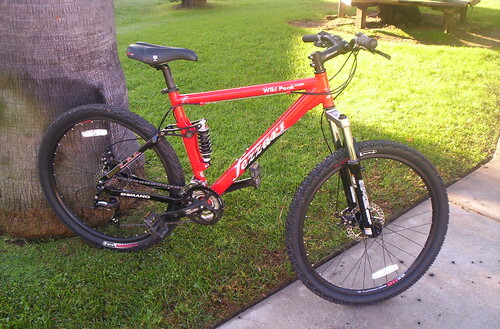 Just yesterday I had a chance to test out the Fezzari Wiki Peak Comp out on the street and on the local trail. On the street the Wiki Peak is as smooth as a road bike. The front and back suspension makes the ride so much more comfortable than a hybrid or any other commuter bike you might use. Then once I got on the trail, I let the machine do what it was built for….TRAIL Riding! Typically, when ever I do any trail riding, I use my Giant Warp. The Warp is a single pivot full suspension bike. 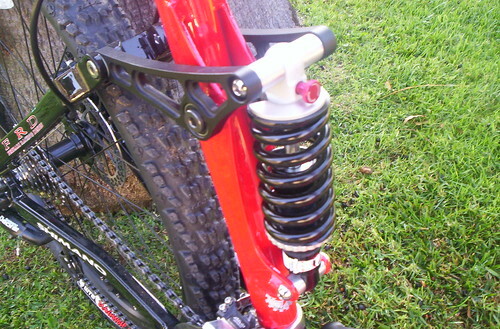 The Wiki Peak is a 4 bar suspension bike. Man, what a contrast between the two bikes! I’ve read all about the differences between single pivot and 4 bar and how the 4 bar is supposedly better because it lessens the pedal bob while climbing. But man I didn’t realize that it made such a difference in the performance of the bike. The Wiki Peak is an awesome trail bike! It absorbs all the bumps of the road and trail. I felt that I had some amazing grip with the WTB Weirwolf tires that complimented the Marzochi MX Fork and the Apro rear shock. The bike has a great “squish” factor (ability to compress the suspension). It’s built with 100mm of travel front and back allowing the rider to jump off curbs, absorb pot holes and light up the trails! If I could summarize the Wiki Peak in one word, it would be…”SWEEEEEEEEEEEEEEEEEET!” So far the Wiki Peak Comp has made a GREAT impression on me and I think if any one else were to ride it, they would easily fall in love with the bike.